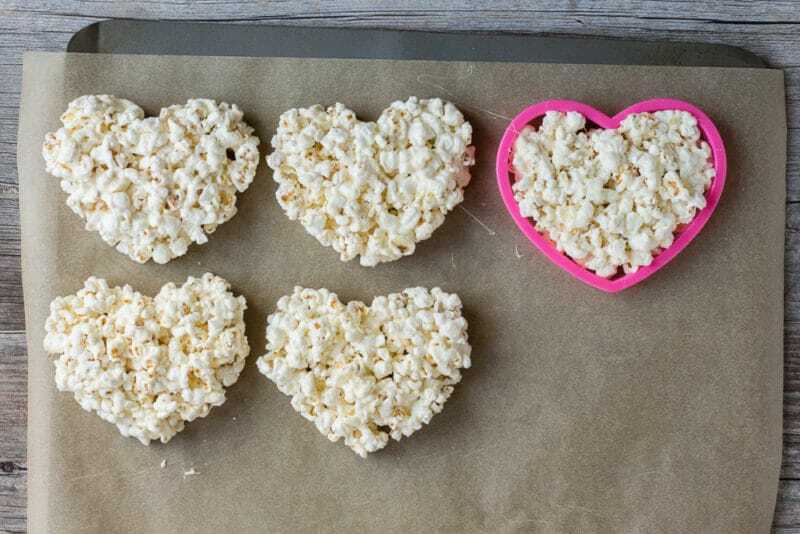 These Marshmallow Popcorn Hearts make for an easy Valentine’s Day recipe. 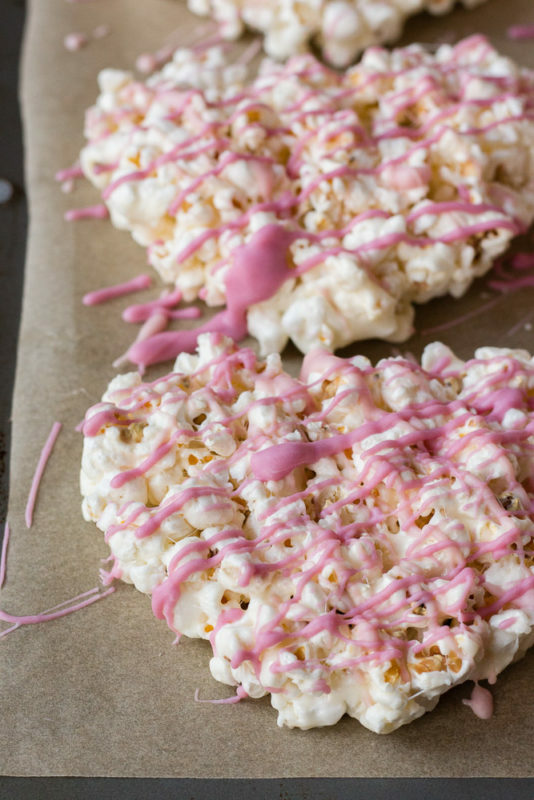 Drizzled with pink white chocolate, they’re sweet treats for kids or adults! Hi everyone! It’s Taryn again from Hot Pan Kitchen. I’ve got a perfect Valentine’s Day recipe for you today that is a fun dessert for any age! 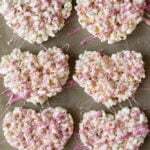 Marshmallow Popcorn Hearts are super easy to make and a sweet way to treat those you love. 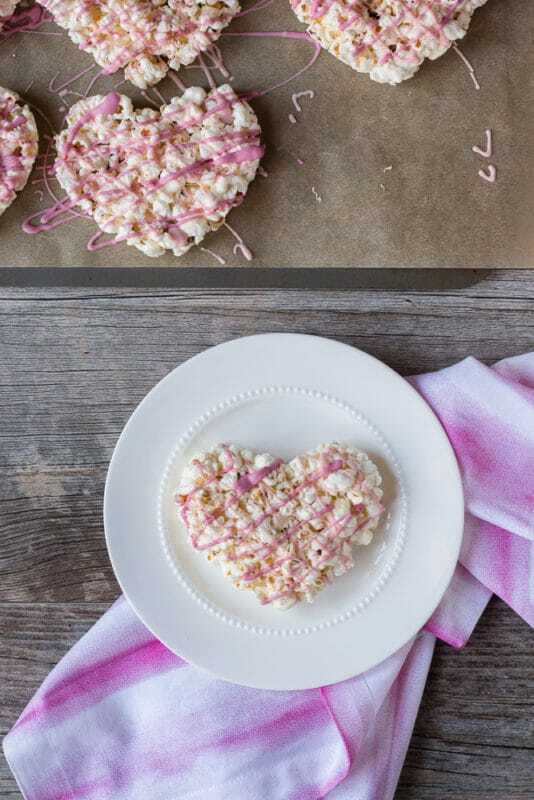 These Marshmallow Popcorn Hearts are a yummy sweet and salty popcorn treat and they are quick, delicious and GLUTEN FREE! Take a sheet pan out and cut a piece of wax paper to fit on the pan. Set it aside for once you make the marshmallow mixture. Pop that microwave popcorn! Be sure to follow the package directions and don’t let it go to long otherwise it will burn. Once done, remove it from the microwave and set it aside. Place the butter and the mini marshmallow in a large microwavable bowl. Microwave on high for 30 seconds, then remove the bowl and stir together as much as you can with a rubber spatula. Repeat that process 2 more times until the butter and marshmallows are completely melted and can be stirred until thoroughly combined. Slowly add the microwave popcorn into the bowl with the marshmallow mixture, being careful not to add in any unpopped kernels. 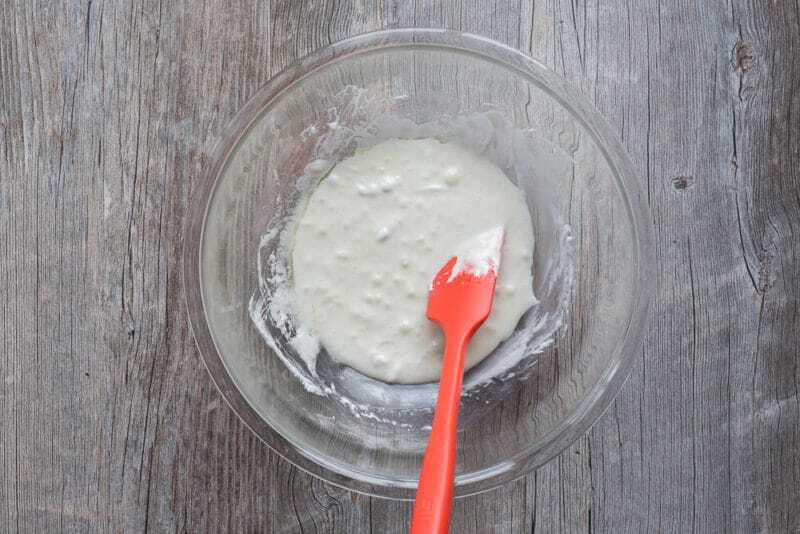 Stir with the spatula until the popcorn is coated with the marshmallow mixture. Get out your heart-shaped cookie cutter and grease it with butter. Do the same with your hands. 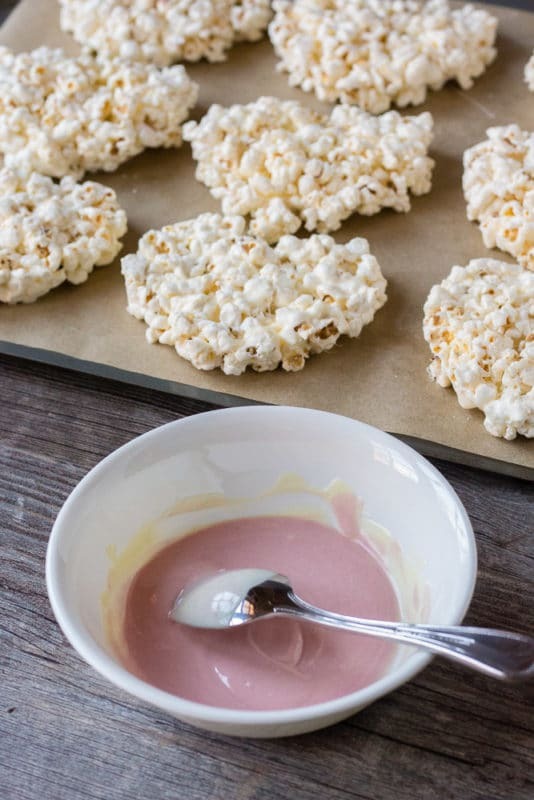 Place the cookie cutter on the wax paper, then take a chunk of popcorn and mold it into the cookie cutter. Squish the popcorn together firmly, as this will help it hold its shape. If you don’t have enough popcorn, add some into the missing gaps, making sure to fill the cookie cutter completely full. If you don’t do this, the heart shape won’t be apparent. Once the cookie cutter is full, gently remove the cutter from the popcorn and continue the process until all the popcorn is used. After the hearts are shaped, take a small microwavable bowl and melt the white chocolate. Start with 30 seconds on high in the microwave, then stir with a spoon, then another 30 seconds and stir, then 10 more seconds if necessary, until the chocolate is a liquid and has a relatively thin consistency. Place one or two drops of food coloring into the chocolate to get a light pink color and mix thoroughly with the spoon. Use the spoon to gradually drizzle half of the white chocolate onto the popcorn hearts in whatever pattern you like. With the remaining half of the white chocolate, add another drop (or more) to get a deeper pink or red color. Use the spoon to do the same gradual drizzle the darker-colored chocolate on top of the lighter colored chocolate. Set in the fridge for at least 10 minutes to harden, then eat! 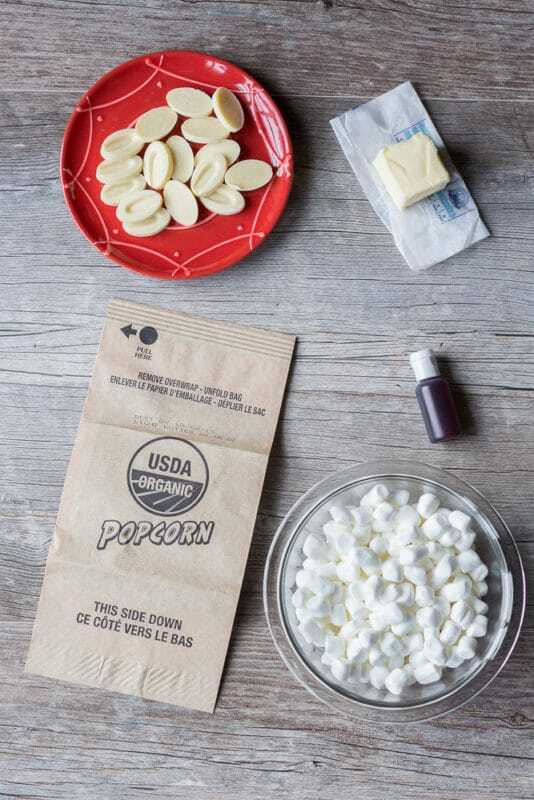 You’ll want to place the popcorn in the marshmallow mixture VERY CAREFULLY so as not to get any kernels in it. It is not fun to bite into a marshmallow popcorn heart and hit a kernel with your teeth, so do everything you can to keep them out. You can use regular sized marshmallows instead of mini, just make sure the weight is the same amount. 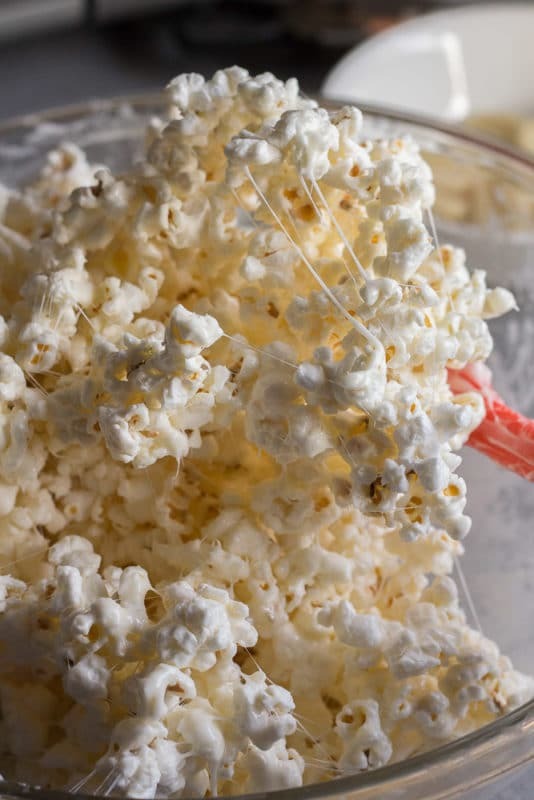 Salted and unbuttered popcorn looks best for this recipe; however, if you like the combination of sweet and salty feel free to use buttered popcorn. These Marshmallow Popcorn Hearts taste best right after they are made. These will keep for a few days if you store them in an airtight container. If you make these Marshmallow Popcorn Hearts then don’t forget to rate the it and let me know how it went in the comments below! You can also FOLLOW ME on INSTAGRAM, FACEBOOK, TWITTER, and PINTEREST to see more good to eat, gluten free food and how I’m trying to get my kids into the kitchen more (without losing my mind). Take a sheet pan and cut a piece of wax paper to fit on the pan. Set aside. Pop the microwave popcorn according to the package directions. Remove from the microwave and set aside. 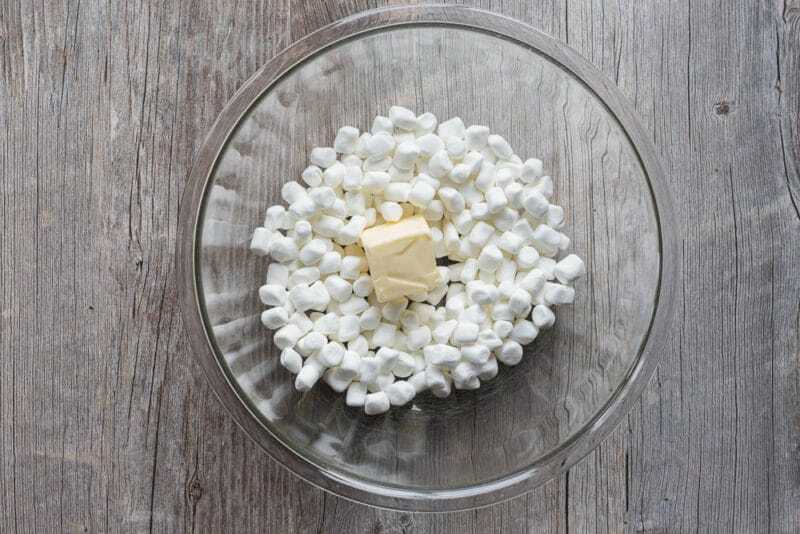 Place the butter and the mini marshmallow in a large microwavable bowl. Microwave on high for 30 seconds, then remove the bowl and stir together as much as you can with a rubber spatula. Repeat that process 2 more times until the butter and marshmallows are completely melted and can be stirred until thoroughly combined. Slowly add the microwave popcorn into the bowl with the marshmallow mixture, being careful not to add any unpopped kernels in. Stir with the spatula until the popcorn is coated with the marshmallow mixture. Get your heart-shaped cookie cutter and grease it with butter. Do the same with your hands. 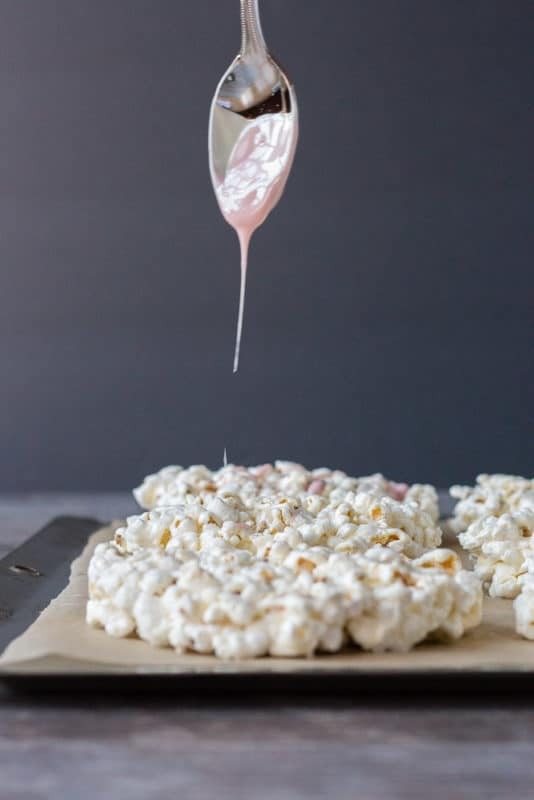 Place the cookie cutter on the wax paper, then take a chunk of popcorn and mold it into the cookie cutter. Squish the popcorn together firmly, as this will help it hold its shape. If you don’t have enough popcorn, add some into the missing gaps, making sure to fill the cookie cutter completely full. If you don’t do this, the heart shape won’t be apparent. Taryn Solie is the content creator, food photographer, and recipe developer behind Hot Pan Kitchen. She creates gluten-free recipes for families who don't want to feel restricted by eating gluten free foods. She also tries to get her kids into the kitchen as much as possible to teach them how to cook. On any given weeknight she's hovering over the stove making family dinner, wine in hand. Love the heart shape! What a fun idea ~ thanks for sharing the recipe :). These are adorable! What a fun twist on all the heart shaped Valentine treats that are so popular this time of year! This is so easy to make and yet so beautiful for Valentine’s day. I will surprise my special someone with this. This actually makes perfect edible gift too. Amazing. Love this recipe!